THIS PAGE IS BEING WORKED ON. IT WILL BE UPDATED SOON. CHECK OUT THE BETA VERSION OF OUR FORMATS DOCUMENT UNDER THE DOCUMENTS SECTION. 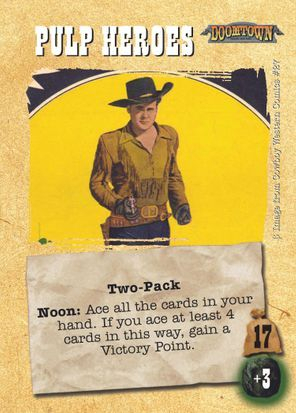 There were many official and sanctioned as well as home-brewed formats for Doomtown back in the day. I am working on collecting and compiling data on those. But I'm launching this page now, because new formats are being released! 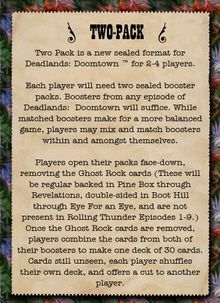 At Gencon 2012 We introduced the format "Two-Pack", a new sealed format for Deadlands: Doomtown™ for 2-4 players. Events were run at the 2012 US and CS championships. 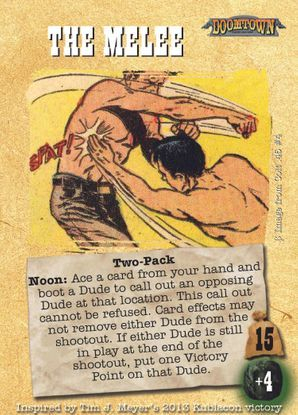 Due to the rarity of booster packs, we developed an extended version of Two-Pack called Pulp Heroes. Each player will need two sealed booster packs. 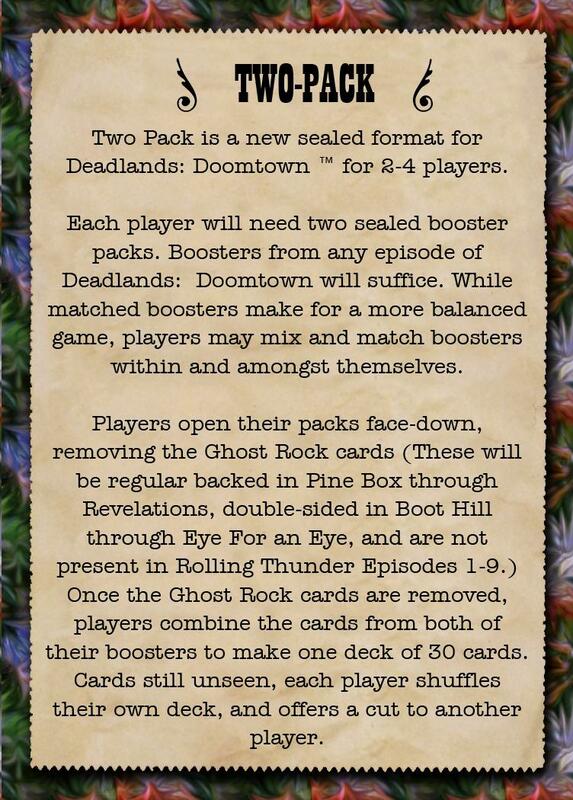 Boosters from any episode of Deadlands: Doomtown will suffice. While matched boosters make for a more balanced game, players may mix and match boosters within and amongst themselves. 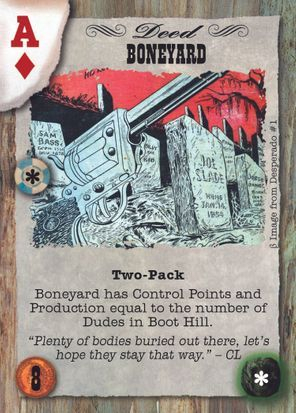 Players open their packs face-down, removing the Ghost Rock cards (These will be regular backed in Pine Box through Revelations, double-sided in Boot Hill through Eye For an Eye, and are not present in Rolling Thunder Episodes 1-9.) Once the Ghost Rock cards are removed, players combine the cards from both of their boosters to make one deck of 30 cards. Cards still unseen, each player shuffles their own deck, and offers a cut to another player. of different players differently, and in the spirit of the format, should be selected randomly. 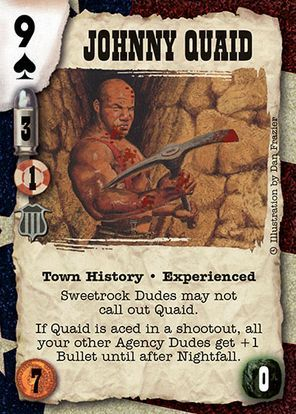 Treat all dudes in your deck as drifters, and thus ignore the extra upkeep rules for out of faction dudes. With respect to other players and any applicable card effects, all dudes belong to their original outfits. 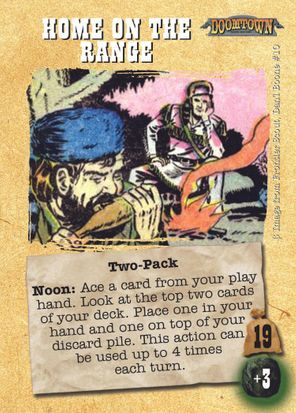 Two-Pack - This keyword signifies that the card was designed for the Two-Pack/ Pulp Heroes format. It is not recommended that it be played in any other format, even for casual play as the cards have not been playtested for balance in draft or constructed formats. At the events where it had been played and at small local events, Two-Pack was a fun, fast, and furious format. 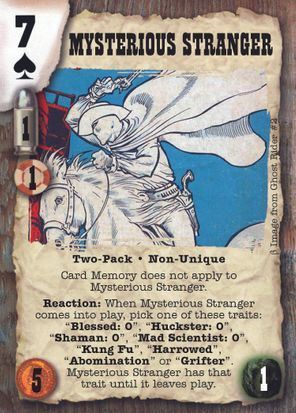 But with sealed packs becoming harder to find and some odd problems that would occasionally come up (No control points in any packs, no dudes on one side of the board, or cards that just shut the game down like Ghost Infestation), HEG developed the Pulp Heroes Pack. 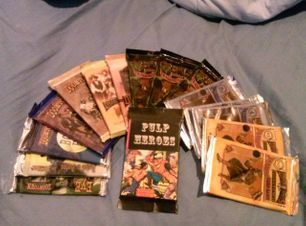 You play with the Pulp Heroes pack in place of one of the two packs you would normally use. The early version played at Kublacon 2013 (shown on the right) was rough around the edges, hurriedly playtested, and poorly edited. The cards have been honed and edited, and now are a 15 card (plus the three homes shown above) pack. Get the PDF and card backs, for those of you interested in printing your own copy! If you would like a professionally printed set, for up to three players, I have set up a "print on demand". It's not cheap, but they do good work! Click HERE for the set. 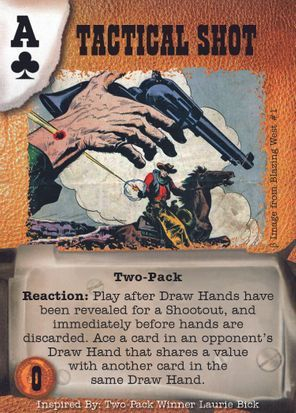 The Two-Pack Format, It's homes and the Pulp Heroes pack are not officially developed parts of Deadlands: Doomtown. They are designed by Harrowed Entertainment Group and are licensed under a Creative Commons Attribution-NonCommercial-NoDerivs 3.0 Unported License. All images used are part of the Public Domain, credit has been given, where possible. Thank you to the original creators. 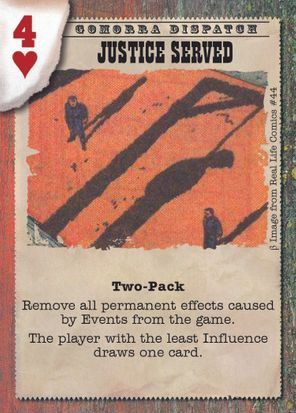 Two-Pack - This keyword signifies the card was designed for the Two-Pack/ Pulp Heroes format, it is not recommended that it be played in any other format, even for casual play as the cards have not been playtested for balance in draft or constructed formats. 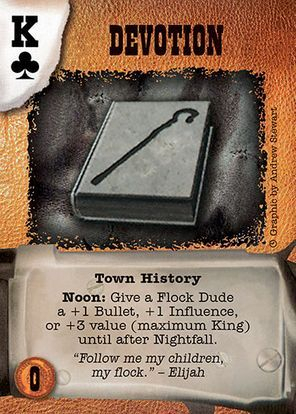 Town History is a special format meant to showcase the history of Gomorra and deck-building skill and versatility. Standard deck building rules apply, except for two rules specific to the format. The first is that the deck is not built for a specific Outfit Home. 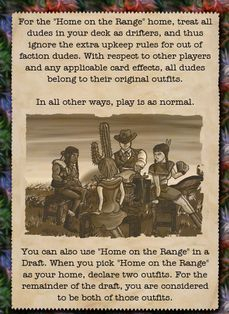 Each deck will play through 3 Outfit Homes each match, yielding a “best two out of three” result. The second rule is that each deck has a 10 card sideboard. Because there are sometimes variations on how specific Homes play, and how different Outfits deal with certain play styles, you are allowed a 10 card sideboard from which you may exchange 3 cards between rounds. You must return your deck to match its deck list between matches. for the Town History Format. Also each faction gets a dude that is meant to be the “Starter Only Dude” for the new Homes listed above. 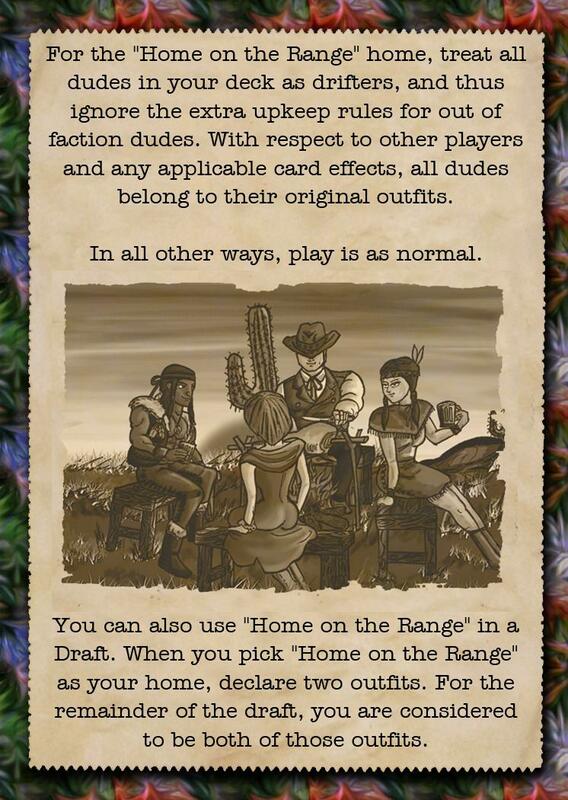 Get the PDF and card backs, for those of you interested in printing your own copy! If you want a Print on Demand Copy, check out store.doomtown.info! 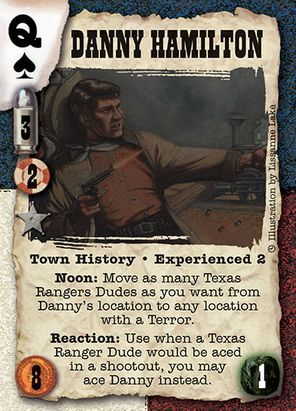 The Town History Format and it's cards are not officially developed parts of Doomtown. They are designed by Harrowed Entertainment Group and are licensed under a Creative Commons Attribution-NonCommercial-NoDerivs 3.0 Unported License. Art for town history is used without permission.It has been altered from it's original appearance, intentionally, to be "transformative." No money is made by HEG off these works. HEG has the utmost respect for the artists and license holders. if any license holder or artist wishes us to remove their art, HEG will do so promptly. Contact us here. 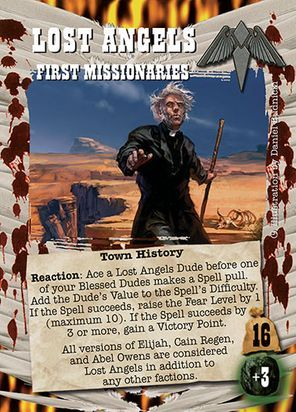 Town History - This keyword signifies the card was designed for the Town History format, it is not recommended that it be played in any other format, except for for casual play, with your opponents consent. The cards have been play-tested in specific environments, but not all possibilities can be taken in to account. Soon there will be a method to request information and rulings, or to bring up questions.